India’s geographical location is central to key international trade routes across the Indian Ocean between Europe and Asia. This offers India a great opportunity to grow into a maritime hub. India has a long coastline of over 7,500 km, which houses its 12 major ports and about 200 non-major ports. 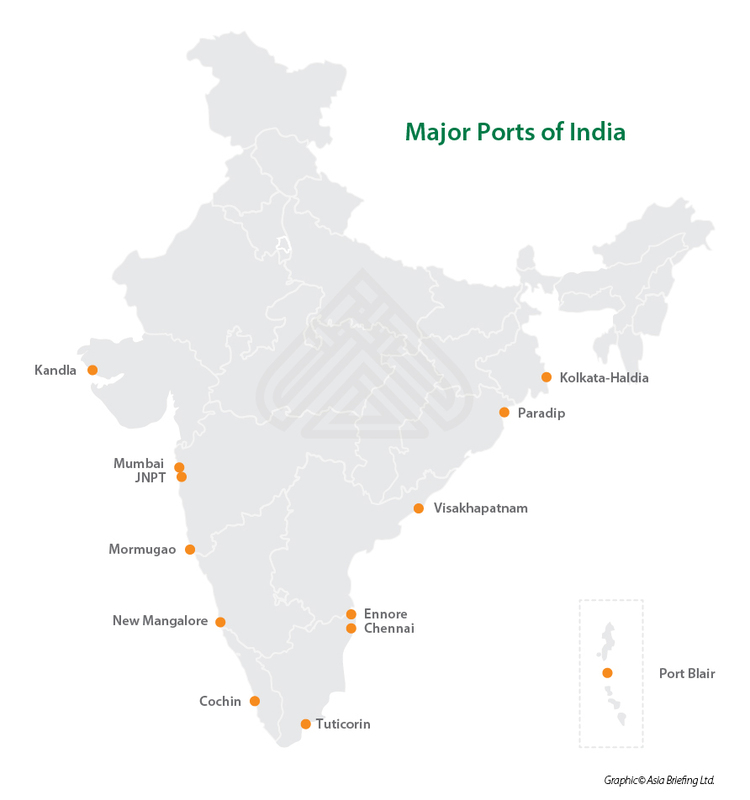 These ports serve as the country’s gateways to global trade, and cater to about 95 percent of India’s total foreign trade (by volume). Yet, inadequate port infrastructure and poor port connectivity has kept India from realizing its full maritime potential. Despite an increase in traffic volume and port capacity in recent years, Indian ports continue to underperform globally. The World Bank’s global performance index, 2016 ranked India 35 out of 160 countries, behind many Asian economies such as Singapore (5), China (25), and Malaysia (32). Turn-around time for ships at major ports in India is 2.04 days, while in other countries, such as Singapore, it is less than a day. This undermines the competitiveness of Indian ports vis-à-vis its neighboring countries. To enhance the efficacy of the India’s maritime infrastructure and attract foreign investment in the sector, the government of India has undertaken several policy reforms and port infrastructure development projects. Some of the major policy reforms are discussed below. The government of India introduced the new CPA Act in December 2016 to replace the existing Major Port Trusts Act, 1963. The new Act seeks to provide more autonomy to the country’s major ports and attempts to professionalize their governance. Towards this end, the Act addresses a majority of the existing governance concerns, and comprises of provisions that will enable the faster development of port infrastructure. For instance, the Act empowers the board of port authority to lease land for port-related use for up to 40 years and for non-port related use, up to 20 years; the federal government’s approval will be needed only for longer leases. The port authority can also appoint consultants, raise loans, and issue securities to manage expenditure. Under the CPA Act, the port authority will set tariffs, which will act as a reference tariff for purposes of bidding for public-private-partnership (PPP) projects; PPP operators will be free to fix tariff based on market conditions. As a result, the Act reduces litigation between the PPP ventures and ports. The government allows up to 100 percent FDI under the automatic route for port and harbor construction and maintenance projects. In September 2016, the government released a revised MCA to encourage private sector participation in the port sector. The new MCA includes provisions, such as the substitution of the minimum guaranteed cargo requirement with the minimum guaranteed revenue, revised tariff guidelines for existing operators, and discounted revenue shares. Further, it allows private players to exit port projects after six years and gives them the power to issue bonds to refinance debt. The government has also facilitated a 10-year tax holiday to companies that develop, maintain and operate ports, inland waterways, and inland ports. Furthermore, the government provides financial assistance of up to 50 percent of the cost of the port development project, subject to a maximum of US$3.88 million (Rs 25 crore). The aforementioned policy measures collectively promote port-led development in the country. However, the success of their intended regulatory relaxations remains contingent on how they actually benefit private players and improve the ease of doing business on the ground, without adding a different layer of bureaucratic red tapism.